Whilst relaxing at the Elephant Camp Lodge overlooking the fast flowing Ewaso Ng’iro river in Samburu Reserve, it’s hard to imagine that just a couple of days ago I was working hard in my office in Sydney. I sit back and enjoy a glass of wine and listen to the bird and elephant calls. I’d been excited to set off on my trip to Kenya for quite some time now to explore the country that pioneered the safari and is home to some of the most famous national parks in all of Africa. 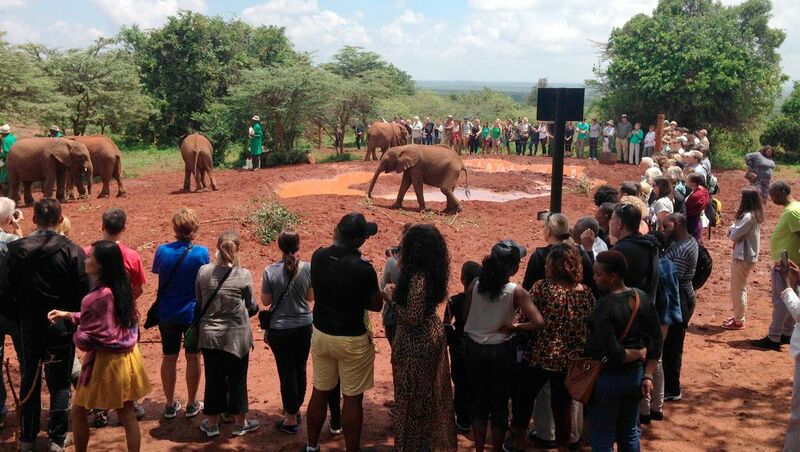 To start the trip I spent a day in Nairobi and visited the David Sheldrick Wildlife Trust, which takes in orphaned baby elephants from different national parks in Kenya. These elephant calves have either become separated from their herd or been abandoned by their mothers. 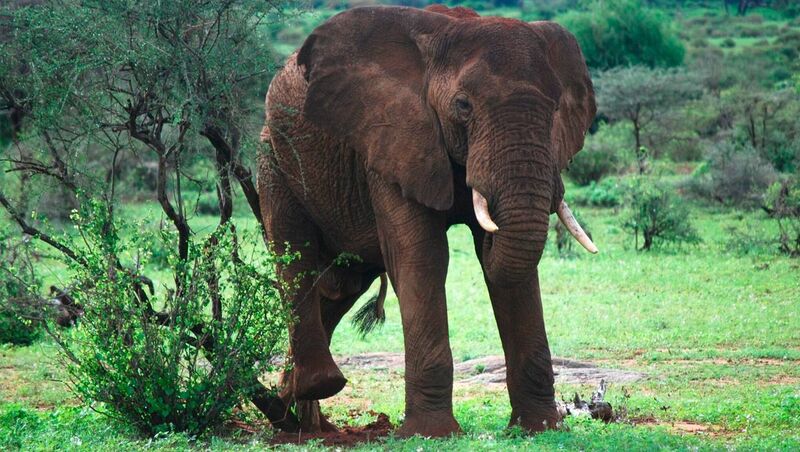 After a few years when they are ready, the elephants get moved to Tsavo Conservation Area in Southern Kenya where they are slowly reintegrated into the wild and they join a wild herd of elephants. It was great to hear about the work the people at the orphanage do and see all the baby elephants wander around and get their feed. Afterwards, I visited the Giraffe Centre which is adjacent to the famous Giraffe Manor hotels and cares for 10 endangered Rothschild Giraffes. Here you can feed the Giraffes, learn about them and even get kissed by one! 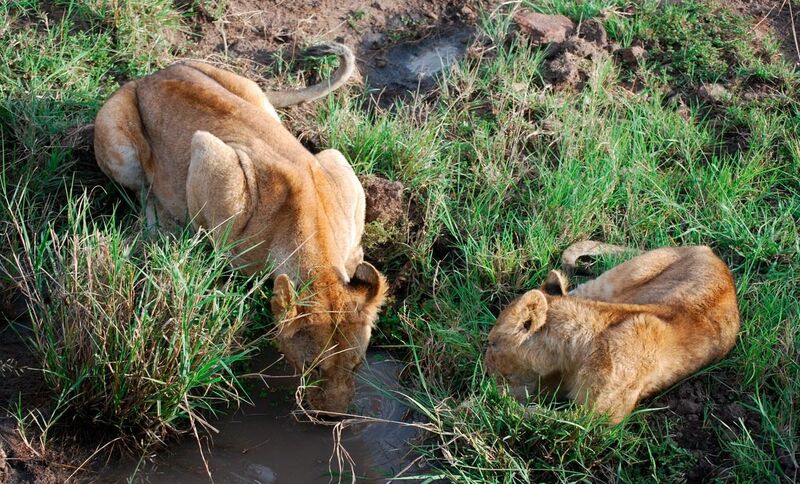 A couple of nights in Nairobi is a great way to get over the jetlag, visit these important nature preservation programs and get excited for your safari. Almost all new hotels are built in the suburbs of Nairobi and are very quiet and tranquil, at times it was hard to believe I was a short drive from the hustle and bustle of Nairobi. The Samburu National Reserve was the first stop on the safari and we arrived after five and a half hours of driving. The first part of the journey was along a recently built highway out of Nairobi, however unfortunately there had been so many instances of collisions that the Kenyan Government had installed speed bumps along the brand new highway to curb the speeds cars were travelling! This slowed our progress somewhat but there were plenty of spots to stop and stretch the legs and pick up a souvenir or two if something caught your eye. Due to its remote location, Samburu has retained much of its natural beauty and tranquillity. With only a few lodges and many of them set on the banks of the river, it makes a lovely first stop after leaving Nairobi. While Samburu does have its share of big cats it is most famous for its many different types of bird species, and for its rare species of animals known as the ‘Samburu 5’ which are Grevy’s zebra, ostrich, reticulated giraffe, gerenuk and beisa oryx. For return safari travellers Samburu offers something unique while also appealing to first timers. 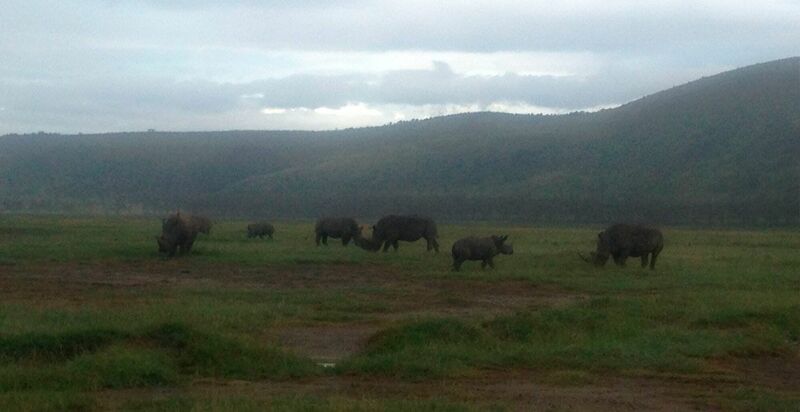 Next stop on the trip was Lake Nakuru – famous for its rhinos! Not having had the luck of seeing rhinos in past trips to Africa I was really hoping to see some this time around, however it seemed like it wasn’t going to be the case. After a long afternoon of game driving and seeing so many animals (but no rhino), with the sun starting to set we headed back to our lodge when suddenly we came across a group of seven rhinos including two baby rhinos! It was such an amazing sight to see them grazing on grass and interacting with each other. The following day, we travelled to Lake Naivasha which boasts more animals per acre than any other in Kenya. It is also the home of Crescent Island, which was the location of the movie “Out of Africa”. It’s easy to see why, with the beautiful scenery and the diversity of the animals. The tour starts with a small boat trip where you get up close with hippos and see how many different birds are in the area. Then you get taken to Crescent Island, where you disembark and start a walking safari among the animals. “Hakuna Matata – no worries” our guide told us as we started to walk – none of the big cat predators were here, just hyenas which are more active at night (he assured us…). It was a peculiar feeling being able to walk the plains amongst antelope and zebras and buffalos just to name a few, but a great experience and something that is a bit different to a regular safari drive. The final stop on the trip was the Maasai Mara National Reserve, famous for the great migration of wildebeest and home of the BBC Big Cat documentaries – due to the large amounts of lions, cheetahs and leopards in the park. I took this trip in November which is during the ‘small rains’ and the migration has already left the Mara for the greener plains of the Serengeti, so I wouldn’t get the opportunity to see the migration this time. That being said I would highly recommend this time of year to travel to Kenya. The parks are much less crowded so often times you will get your own private safari vehicle, and it is was very unlikely to see more than one or two other vehicles at a point of interest. The lodges aren’t at capacity, so you get a more personalised, less crowded experience and at some lodges the rates are around half what they are during the migration. On an afternoon game drive we came across two jackals circling a baby topi (an antelope) and her mother. Jackals are known to be scavengers and very shy animals, so it is rare for them to attempt to make a kill. Working as a team, the jackals surrounded the topi and her baby, and when the mother charged one jackal to scare it away the other jackal would quickly attack the baby in the few seconds it took for the mother to turn and charge the other jackal. Eventually, the mother tired and all she could do was watch on as the jackals feasted on their dinner. 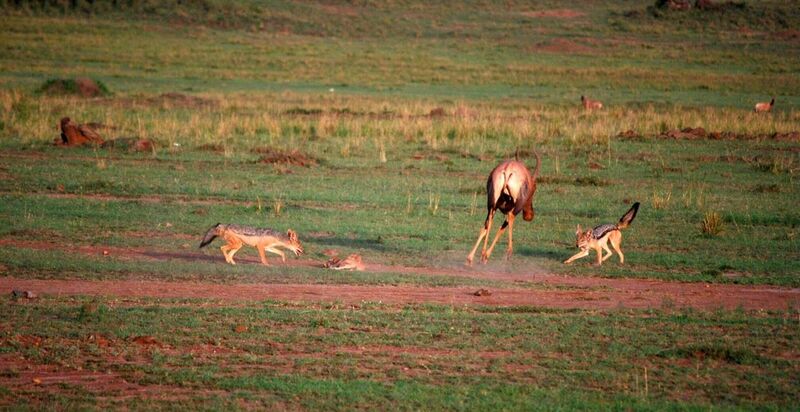 It was with mixed emotions I watched on, to see the ingenuity of the two jackals and nature at its most raw. 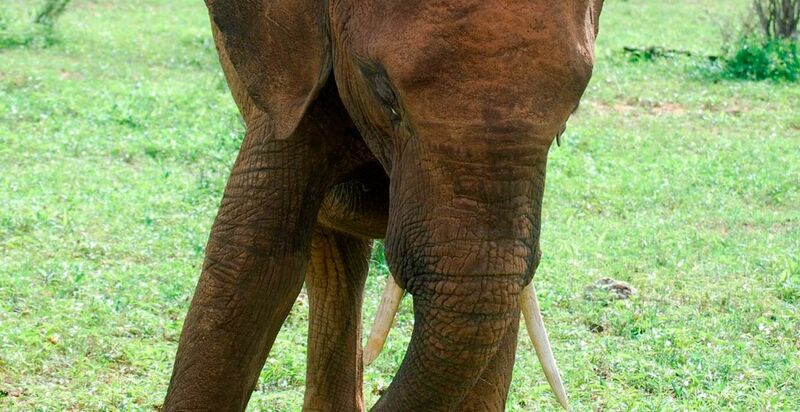 It was a special experience but to see the mother who had a gestation period of eight months tire as she tried to protect her baby was heartbreaking. Having stayed at a number of lodges in the Mara as well as in other parks, I would strongly recommend considering what style of lodge you would like to stay at, and what is most important to you before you book your safari to Africa, as the accommodation options vary considerably and can really enhance or detract from your experience. From the different camps we inspected, some of the major factors that stood out to me were: How close to nature do you want to be? Some camps are unfenced and located extremely close to animals. How active do you want to be on your trip? It’s exciting to venture out on a game drive without knowing what you will discover, but it can also be just as nice if the lodge is well situated to sit at the lodge and watch the wildlife that surrounds you. Exclusivity? Smaller camps are becoming the norm in many national parks now, so travellers get a personalised experience – however there are some larger lodges out there that can make a trip more affordable. On our last day in Maasai Mara, we were lucky enough to avoid the long drive back to Nairobi by taking a small flight to Wilson Airport. It was such a pleasure to be able to avoid the six hours of bumpy roads and be back in Nairobi in less than an hour – I would definitely recommend a flying safari if the budget can allow it. Once landed, we celebrated the end of our trip at the infamous Carnivore restaurant. Once famous for serving a selection of game meat it now only serves meat which can be farmed due to restrictions by the government, however there was still plenty of food to go around and a great way to end the trip. My final night was in an airport hotel within the secure zone off the airport which includes complimentary shuttles to and from the airport. A great option for travellers not looking to spend time in Nairobi but keen to explore the national parks of Kenya. 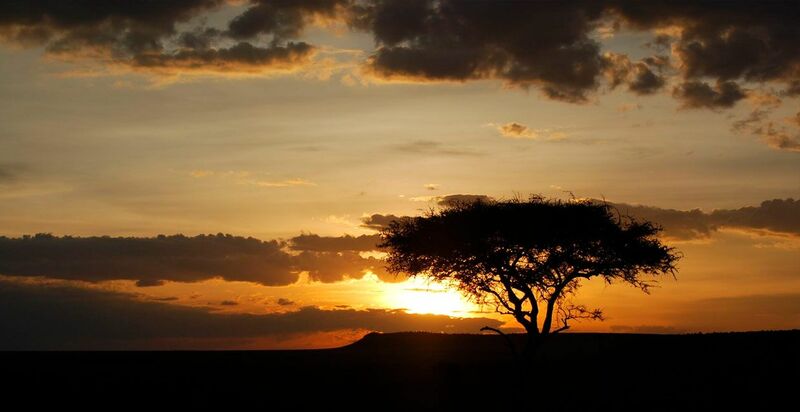 And so, the sun sets on another African adventure filled with unforgettable experiences, scenery, animals, culture and much more. Asante sana Kenya – see you again soon. If you want to find out more about the Samburu National Reserve, Lake Nakuru & the Maasai Mara National Reserve, or have any questions in general please contact us.